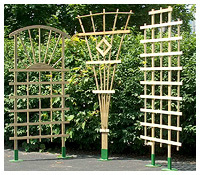 The S-5 Spice Trellis adds a little something extra to your container gardening and landscape. This wider small trellis provides the perfect backdrop for your potted plants to bring out their true colors. Used as an accent piece or to maintain your climbing plants and vines, Country Craft's S-5 Spice trellis can add flavor and beauty throughout your garden and backyard.